Branding: a "Name, term, design, symbol, or any other feature that identifies one seller's good or service as distinct from those of other sellers." 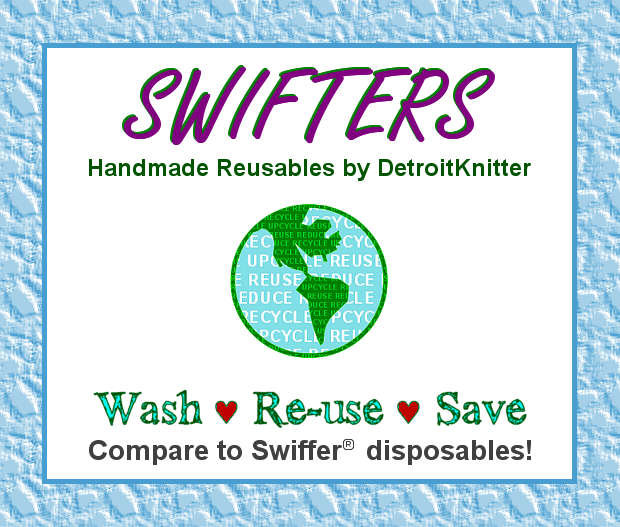 I've always known that I needed to come up with my own branding for my reusable Swiffer style pads other than "reusable Swiffer style pads". 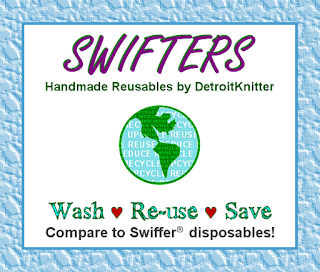 I maybe pushing the trademark envelope here, but I've branded them as "Swifters". Actually all of my reusables fall under the "brand name" Swifters. I decided to do this mostly to make packaging easier :) I now have just one identifying tag that I use as a wrapper for all of them and then for each different style I have different information sheets that are included in the package. This is saving me quite a bit of time... and that's a good thing! Here's the tag I designed that goes on the paper (kraft or scraps of card stock strips that I cut something else off of). I've been using the new tag exclusively now that I ran out of my old wrappers that had leaves all over them. My layout allows me to print 24 of these on 1 card stock page then I just cut them using my paper cutter.